На данном уроке мы поговорим об относительных придаточных предложениях – Relative clauses. В ходе занятия мы узнаем, какие местоимения и наречия используются в предложениях данного типа, в чем состоит различие между ними, а также в каких случаях можно опускать относительные местоимения. We can use relative clauses to join two sentences or to give more information about something. 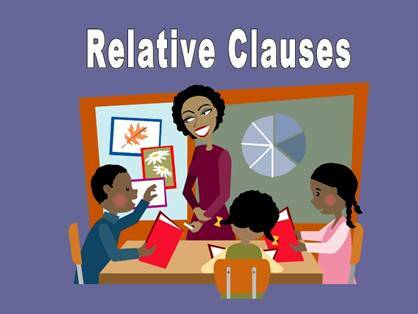 We use relative clauses to describe people, things, time, places or reasons. Relative pronoun comes after the noun it describes. The boy who won the prize was happy. Those jeans which you want to buy are really expensive. Relative clauses can be identifying (ограничительные) or non-identifying (распространительные). Identifying clauses give essential information. The sentence will not be complete without them. 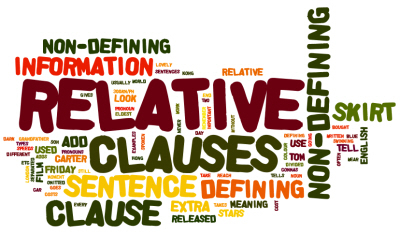 Non-identifying clauses are more often used in written English than in spoken English. They give extrai nformation we do not usually need to understand the sense of the sentence. They usually go between commas. 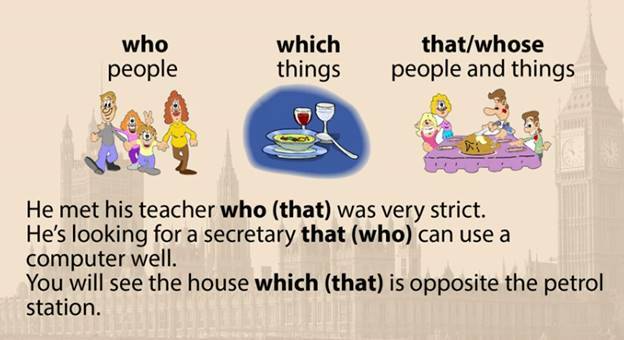 Non-identifying relative clauses can use most relative pronouns but they can’t use ‘that’. без него предложение не завершено по смыслу. This is the new car that I bought yesterday. – Это новая машина, которую я купил вчера. The ring which he bought for her is beautiful. – Кольцо, которое он купил для нее, прекрасно. The book that you see on the table cost me twenty pounds. – Книга, которую ты видишь на столе, стоила мне двадцать фунтов. The school, where I studied, is in the centre of the city. – Школа, где я учился, в центре города. The textbooks, which the students like, have lots of helpful examples. – В учебниках, которые нравятся студентам, очень много полезных примеров. John, who plays football, is always busy at weekends. – Джон, который играет в футбол, очень занят на выходных. 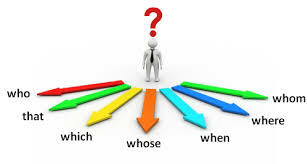 Relative pronouns can be either a subject or an object in relative clauses. 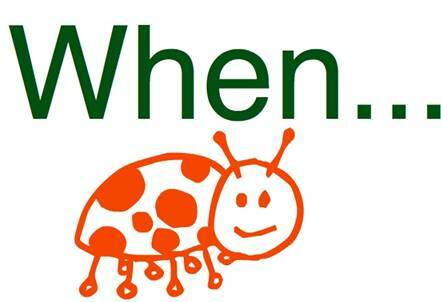 When a relative pronoun is a subject, it is followed by a verb. 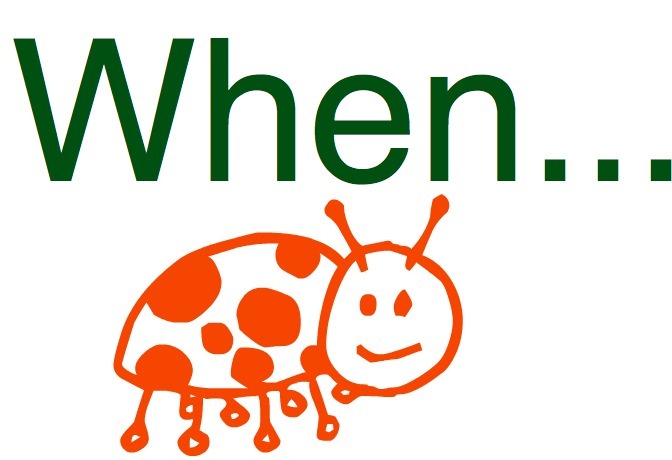 When it is an object, it is followed by a noun or a pronoun. Do you know the man who talked to me? The peaches that are lying on the table are tasty. We will stay at a hotel which is next to the beach. That is the film which is very exciting. Do you know the man who I talked to? The peaches that you bought in the shop are tasty. We will stay at a hotel which my friend has recommended to us. That is the film which I like very much. He met his teacher who was very strict. – Он встретил своего учителя, который был очень строгим. He’s looking for a secretary that can use a computer well. – Он ищет секретаря, который хорошо умеет пользоваться компьютером. You will see the house which is opposite the petrol station. – Ты увидишь дом, который напротив заправки. The camera that costs about 200 pounds has been lost. – Фотоаппарат, который стоит около двух сотен фунтов, был потерян. The little girl whose doll was broken is crying. – Маленькая девочка, чья кукла поломана, плачет. The house whose roof is white belongs to my grandparents. – Дом, крыша которого белая, принадлежит моим бабушке и дедушке. A relative pronoun introduces a relative clause. But there are some cases when you can omit a relative pronoun. Omission of the relative pronoun is possible if a pronoun functions as the object of a main clause. Do you know the girl who he is talking to? Do you know the girl he is talking to? The film which/that I saw two days ago was very interesting. The film I saw two days ago was very interesting. I didn’t like the book which/that you gave me. I didn’t like the book you gave me. Where is the pencil which/that I lent you? Where is the pencil I lent you? Чтобы лучше понять и усвоить особенности употребления относительных придаточных предложений, необходимо выполнить следующее упражнение. Example: I wrote to the friend. He had a birthday last week. – I wrote to the friend who/that had a birthday last week. I bought a house. It was nice. Alice has got a friend. He dances well. He received the letter. He was waiting for it. Max has become an actor. You met him last year. I was happy to get a letter from my friend. He has been travelling around the world. This dress costs a lot of money. It has a handmade embroidery. I forgot to print the article. I wrote it yesterday. The boy was sad. His bike was broken. I bought a house which/that was nice. Alice has got a friend who/that dances well. He received the letter which/that he was waiting for. Max who/that you met last year has become an actor. I was happy to get a letter from my friend who/that has been travelling around the world. This dress whose embroidery is handmade costs a lot of money. I forgot to print the article which/that I wrote yesterday. The boy whose bike was broken was sad. This is the café where I ate a delicious cake yesterday. – Это то кафе, где вчера я ел вкусный торт. Tell me the reason why you are crying. – Скажи мне причину, почему ты плачешь. My favorite day of the week is Friday, when the weekend is about to begin. – Мой любимый день недели – пятница, когда выходные вот-вот начнутся. We will visit the castle........the kings lived. Winter is the time of the year..........many people suffer from flu. I can’t understand the reason...........you have been late for work. Do you know the reason............she is so upset? This is the library...........you can find even rare books. The school...........I study is near my house. This is the reason...........I never invite her to the party. I remember the day............I went to school. We will visit the castle where the kings lived. Winter is the time of the year when many people suffer from flu. I can’t understand the reason why you have been late for work. Do you know the reason why she is so upset? This is the library where you can find even rare books. The school where I study is near my house. This is the reason why I never invite her to the party. I remember the day when I went to school. Афанасьева О.В., Михеева И.В. Английский язык. 9 класс. – М.: Дрофа – 2008. Биболетова М.З., Трубанева Н.Н. Английский язык. 9 класс. – М.: Титул – 2008. 1. Fill in the gaps with the most appropriate relative pronouns. a) This is the store..........was robbed last week. b) The bag..........I bought is blue. c) She wore a costume...........made her look funny. d) The girl...........door was open was waiting for the guests. e) The boy............rode a horse was very handsome. f) This is the gadget...........price is really high. 2. Fill in the gaps with the most appropriate relative adverbs. a) The morning...........you came to me was wonderful. b) The café............we went last Friday is really nice. c) This is the place...........I can be alone. d) Tell me the reason............you are smiling. e) The department store............you work as a shop assistant gets a lot of customers every day. f) Could you explain me the choice.............you study this subject. 3. Переведите на английский язык, обращая внимание на относительные местоимения. а) Мужчине, который живет по соседству, 60 лет. б) Мальчик, который потерял свой дневник, очень невнимательный. в) Игрушки, которые лежат на столе, мои. г) Книга, которую я читаю, очень интересная. д) Я не знаю никого, чьи родители были бы учителями. е) Мама выбрала продукты, которые были дешевле. ж) Те люди, которые мало спят, чаще подвержены перепадам настроения. з) Спортсмены, которые много тренируются, побеждают на соревнованиях.